Painting concrete is an easy way to spice up your living space. It's a little time-consuming, but if you're willing to take the time, the outcome will be well worth it. Dull concrete doesn't have to take away from your d&#xE9;cor. Painting concrete instead can actually add to your d&#xE9;cor as a great finishing touch. Remove the previous paint. Scrape the floor with a wire brush, brushing the floor in small, circular motions. The paint will start to thin and chip. 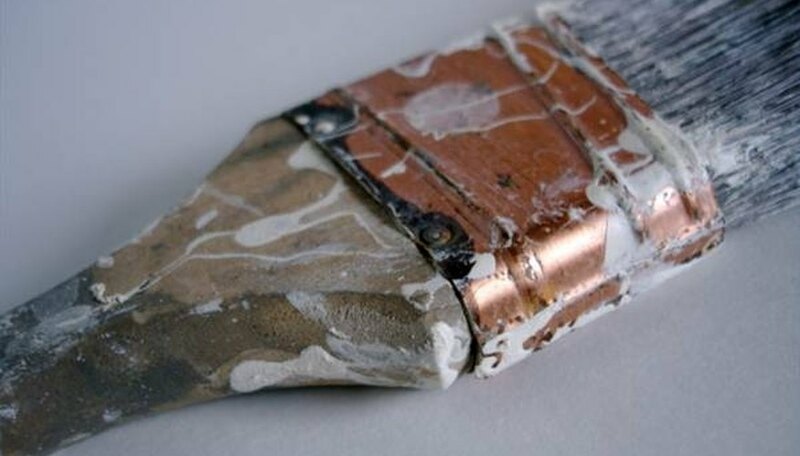 Once the paint starts chipping, brush from the edges of the paint to get a better hold, which will remove the paint faster. After you have finished removing paint from the entire concrete surface, sweep everything up. Clean the concrete. It is important to have clean concrete before painting. Any oils left on the floor will cause your new paint to lift up. Fill a bucket up with warm water and add 1 cup of detergent. Use a sponge mop to clean the floors. Apply a good amount of pressure to ensure the oils are removed. After you have mopped the entire floor thoroughly, rinse out your mop and bucket. Refill the bucket with clean water and mop the floor again with clean water, rinsing away all of the detergent. Pat up excess water with a clean towel and leave the concrete to dry for 24 hours. Prime the concrete surface. Primer fills in small holes and crevasses that you don't want to show through on your final finish. Use a primer specifically for concrete, as it will prepare the concrete to accept a polyurea coating. This means it will bond to the paint, rather than allowing the paint to easily peel and chip off during everyday activity. Using a paint roller, apply a generous, even coat of primer to the entire floor. Let the primer dry for 24 hours. Paint the concrete with your chosen base color. If you're painting an outside area, use outdoor paint so that your paint can withstand harsh weather. For inside living spaces there are additives you can mix into your paint to add texture to your flooring. Apply thin, even coats across the floor, using a paint roller, covering all of the primer. When painting with your final color, use thin coats so that the final finish will be sturdier. Thick coats will peel more easily. Your first coat will most likely still show some primer through the paint and it will not be as vibrant as you expect. After you have finished painting your first coat, allow the floor to dry for 6 to 12 hours. Apply a second coat when the floor is completely dry, and repeat until you have reached the color you like. You will usually need to apply two to four coats of paint, depending on the color and brand of paint. Allow the paint to dry thoroughly. Apply a clear coat of paint sealer. Paint sealer is a clear, protective coat that stops the paint from chipping. Clear coats come in glossy, matte or satin finishes. Apply a single generous, even coat with a paint roller. Wait 24 to 36 hours before walking on the concrete surface or moving furniture into the room. H.C. Hisel has worked for the past nine years as a professional writer, dancer, musician, painter and photographer. Hisel had her own weekly newspaper column in the Banana 411, a newspaper for kids. Her articles have been published in various print markets and online, including Trails.com and Golflink.com.